Did your dog just pick up this nasty habit of eating poop? Is he sick and how to stop him from eating his own feces? I understand your concern and knee-jerk reaction to this gross habit. You may probably be thinking why on earth does your dog want to consume his own stool when there are so much delicious things to eat. Although you may find this habit utterly gross but there is nothing to be immediately alarmed as this is a quite normal behavior in puppies and dogs. In fact stool-eating, technically known as Coprophagia, is common in many animals and there are a variety of reasons for this behavior. For example, rabbits and hamsters are commonly known to eat their own feces in order to extract more nutrients from their food. So here are some of the top reasons why your dog eats his own poop. Once you have accepted that it is a normal and natural behavior for dogs to eat feces, you will begin to realize that it’s not as obscene as it appears. Your dog eating his poop is not harmful for his general health unless the stool is contaminated with fleas, worms or other parasites that may carry bacteria and viruses. If that happens, you should take your dog to veterinarian for checkup. Poop ingestion typically begins when dogs are young puppies. At very early stage, your puppy learns this behavior from his mother who often eats young puppy’s stool to keep the area clean and to protect them from worms and other predator that might be drawn by the scent of the stool. Puppies primarily learn it from their mother and usually stop eating poop when they begin consuming dog food but in some cases, puppies keep this habit until they become adult. This habit can easily be reversed by proper behavioral training and feeding good quality dog food. Now, let’s discuss these reasons in a little more details. The primary reason for dogs to start eating their own feces is that they may not be able to digest their food properly due to the presence of low-quality ingredients in their dog food. Dog’s digestive system is completely dependent on enzymes to breakdown nutrients from his diet but often, commercial dog food does not sit well with his stomach due to the lack of high-quality animal protein and far more carbohydrate sources (wheat, corn and soy) that are not easily digestible. So feeding your dog a premium quality dog food not only keeps his digestion system healthy but also he will produce less waste. As a result, he will avoid consuming his stool. Often, in city apartments where dogs have to spend the whole day alone, they tend to develop the habit of eating their poop to cure hunger due to the unavailability of real food. In many other cases, if the dog has internal parasites and warms, then they can leach the nutrients out from the dog’s body and that will make him hungry more often than usual. To satisfy his hunger, dog may start ingesting his feces if he could not find any food. In case of internal parasites, take your dog to the veterinarian for checkup. Anxiety and stress often drive dogs to eat their own poop. Your dog or puppy can be stressful for variety of reason, such as changes in lifestyle, food and disturbed routine. When his daily routine is disturbed in a way, such as a new roommate, new pet, baby, job or new home, an emotionally sensitive dog can become upset, stressed and anxious. So it’s important for your dog’s mental health to keep a consistent daily routine and active lifestyle. Loneliness and boredom is another major cause for poop eating behavior in dogs. Lack of enough activity and public interaction may lead your dog to start playing with his own stool and then often advance to consuming it. Bored dogs tend to develop far strange disturbing behaviors than active dogs. That’s why they regularly need exercise, playtime and lots of toys & puzzles to keep them occupied whole day. At early stage, puppies learn from their mothers to keep their personal space clean. While sometimes they develop the habit of eating bodily waste when they are chained or kept into a small restricted space. 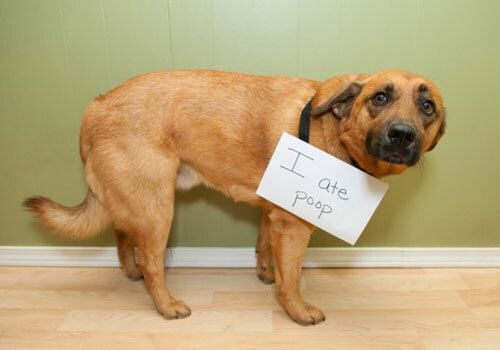 Dogs often eat their poop to clean the area. Sometimes when a owner clean dog’s stool, they misjudge the intent and try to copy their owners by eating feces as resort to their own “housekeeping” efforts. Dogs are great students. They learn from their experience and more importantly from their owner’s reactions. Sometimes dog owners punish or spank their dogs for defecating inside the house. This type of inappropriate/harsh punishment can make dogs eat their poop to hide the evidence and avoid being punished. In this case, punishment is not a correct solution but appropriate training is. Also dog owners should not react in a way that is alarming to the dog when they defecate inside the house. If you have already responded several times to your dog’s attention seeking activities, such as jumping, barking, whining etc., then it’s very good possibility that may be your dog is picking up this nasty habit to grab your attention when you are busy working or watching TV. Even though it may not be the right way to get attention, but your dogs does not know that. Negative attention is still attention after all and your dog just wants to gain any extra attention he can get. A proper training is the solution for this type of behavior. This may sound weird to you but sometimes dogs eat their feces because they like the taste of it. For a dog, his feces are aromatic and tasty and often stuffed with lots of nutrients. In fact, some scientists believe it to be one of the major reasons behind this strange behavior. Some researcher suggest adding a small amount of meat tenderizer or digestible additives, such as pumpkin, pineapple or stool deterrent supplements, into dog food can help as it makes the poop taste extremely bitter and undesirable for dogs. Watch the video by Dr. Stephen Brammeier of Kingsbury Animal Hospital. He tries to explain why dogs either eat their own poop or another animals. 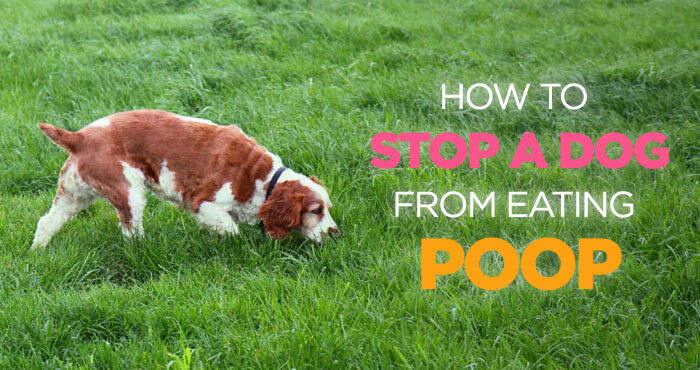 These are some of the most common reasons behind your dog’s disgusting habit of eating poop. Many times it is easier to correct this behavior by adjusting lifestyle and feeding a high-quality dog food. However, sometimes it can be a serious behavioral or health related problem which immediate needs medical attention or this could lead to more severe health problems. 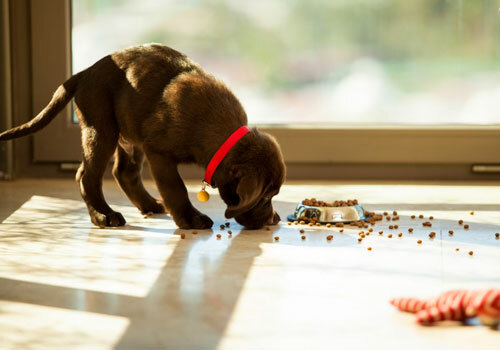 Here are several helpful tips to rid your dog of this bad habit. Feed your dog a high-quality dog food with lots of meat protein and low carbohydrates. Make sure your dog is getting all of the protein, fat, vitamins, minerals and other nutrients that he needs for physical and mental growth. Make sure your dog’s eating place and poop place are far apart from one another. Keep the yard, crate and your dog’s personal space clean. If you’re dog defecting inside the house, clean it up immediately to avoid giving him any chance to play with the stool and eat it. 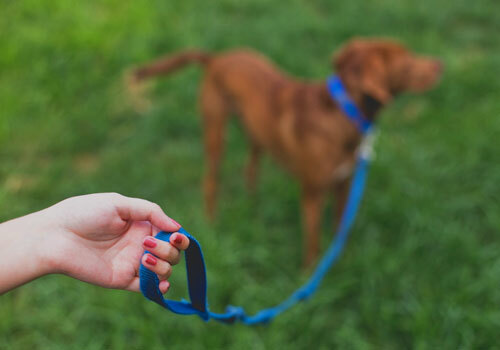 Try placing your dog on leash when you take him outside to prevent him from sniffing and ingesting other dog’s stool. 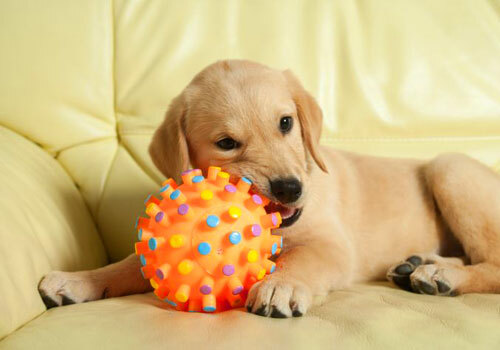 Keep him occupied with puzzles, chew toys, exercise, playtime and other activities. Train your dog to leave things alone on your commands, such as No, ‘nah-ah-ahhh’ or ‘leave it’ and distract him with praise supported with treats. Make sure to take him out regularly to give him chance to eliminate before placing him into his crate. Avoid leaving him alone for long periods of time. Instead of harsh punishments, teach in a sensible and effective approach. If necessary, use meat tenderizer, MSG or digestible additives in dog food to make it taste bitter. This is particularly effective when your dog eat his poop in your absence as you won’t be around to stop him. There are also products (Bitter apple sprays) available in the market that you can put on the poop itself to make it less interesting to the dog. Take your dog to the veterinarian for regular checkup for any clinical issues and have his stool checked every 6 months. 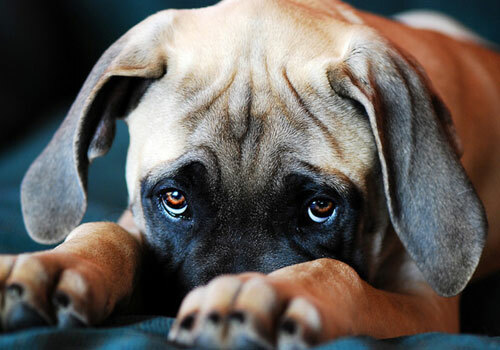 Remember Coprophagia is a very common habit in dogs and sometimes it can be very hard to break this habit since it is self-reinforcing, but don’t let this discourage you. Patience is the key. 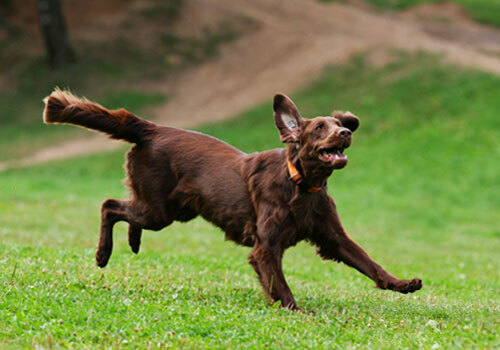 Try to spend more time with your dog and keep him busy with lots of different indoor and outdoor activities. In no time, your dog will be able to reverse this habit of eating poop. Our 7 mth old chihuahua eats his poo and then he vomits it up. The eating of the poo is not the issue . It is the vomiting that scares us and sometimes he does not eat or drink for a day because the vomiting episode was so bad. I give him water with a syringe to prevent dehydration and he takes it but lays in his bed all day long and shakes / quivers. We have tried adding raw pumpkin to his food and a powder that the vet gave us to stop him from eating his poo but with no luck at all. He eats his poo if we don’t remove it as soon as he releases it. We are considering adding meat tenderizer to his food next….not sure what else to try. ??? ?